What happens if you have a one-nighter—with a ghost? Halloween, 1982. MTV is new, poodle perms are the rage, and life just might be getting better for Alma Kobel. Her ugly divorce is final at last. Her new job as chef at Bright Day School’s gorgeous old estate is actually fun. But the place is haunted—and so is Alma’s apartment. Bartholomew Addison Jenkins’ ghost has been invisibly watching Alma for months. When he materializes one night, Alma discovers Bart—as he likes to be called—has talents she couldn’t have imagined … and a horrifying past. Can you have a one-nighter with a ghost? And what happens if you decide one night is all you want—and end up ghosting him? Some spirits don’t like taking “no” for an answer. Alma is broke after her divorce but happy as a chef at Bright Day School’s where she is in charge of the kitchen staff and all the meals. The estate is fun, beautiful and did I mention haunted? Alma is shocked to find out she’s had a ghost at her apartment watching her for quite a while by the name of Bartholomew Addison Jenkins who died in the 1700’s. She’s also surprised to find that he is somewhat of a legend in town. A cute little story that takes place in the early 80’s about love, ghosts, and everyday life. The characters are relatable with a few little surprises along the way. The sparks that ignite enhance the story’s romance. A ghost. Of course he was a ghost—even though before that night, she’d never felt anything spooky at her place in the almost-year she’d lived in it. Alma still had the plate with the omelet on it in one hand. Ghosts didn’t eat, did they? She held it out to him anyway. Alma nodded, not sure what to say. For a ghost, the man looked rather … dashing, she decided was the world. He must have been muscular in life. There were nicely rounded biceps under that loose shirt, and they showed when he moved his arms. His knee knickers fit tightly over a flat belly, and his stockings made his calves look like they were made out of smooth, white marble. His eyes were a startling, luminous golden brown. The man nodded. “Your dead,” he said, solemnly. “Well, you live here, don’t you? 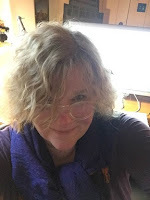 So, I’m your dead, now.” He stopped looking so serious then and as if guys in knee knickers and white stockings were born doing it, he opened her refrigerator and pulled out the bottle of Chablis. “Here, give me your glass,” he said, and topped it off. The glow from the refrigerator’s light made him even more luminous—and just the slightest bit translucent. “Thanks,” she said, although it was her wine. She put her plate and glass down on a little enamel-topped kitchen table she’d bought at a local church thrift shop and pulled out one of the table’s funky old chairs for herself. “Fork? Napkin?” he said, pulling those things out of the drawers next to Alma’s stove. Alma used cloth napkins from the restaurant supplier—big white ones. “You know where my things are,” she said, spreading the napkin across her lap. “My lady.” He smiled and handed it to her with a little bow. She ground a little pepper over her plate and took another bite and sipped her wine. He sat down across from her, put his elbows on the table, and his chin in his hands. Aletta Thorne believes in ghosts. In her non-writing life, she is a choral singer, a poet, a sometimes DJ, and a writer about things non-supernatural. But she’s happiest in front of a glowing screen, giving voice to whoever it is that got her two cats all riled up at three AM. Yes, her house is the oldest one on her street. And of course, it’s quite seriously haunted (scared the ghost investigator who came to check it out). She is named after a little girl in her family who died in the late nineteenth century, at the age of two. 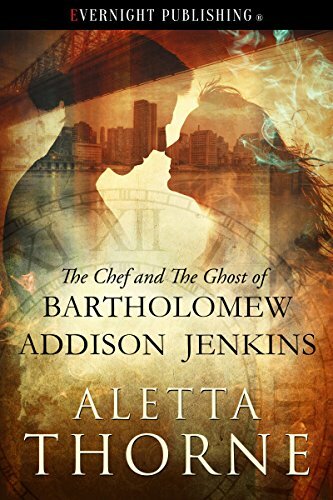 The Chef and the Ghost of Bartholomew Addison Jenkins is her first romance.